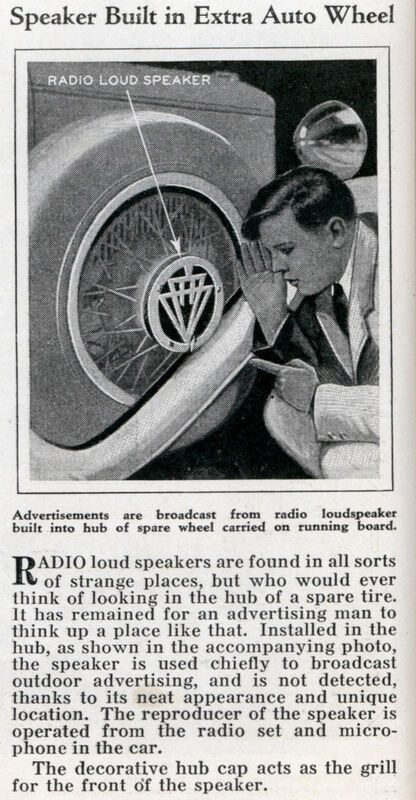 RADIO loud speakers are found in all sorts of strange places, but who would ever think of looking in the hub of a spare tire. It has remained for an advertising man to think up a place like that. Installed in the hub, as shown in the accompanying photo, the speaker is used chiefly to broadcast outdoor advertising, and is not detected, thanks to its neat appearance and unique location. The reproducer of the speaker is operated from the radio set and microphone in the car. The decorative hub cap acts as the grill for the front of the speaker.